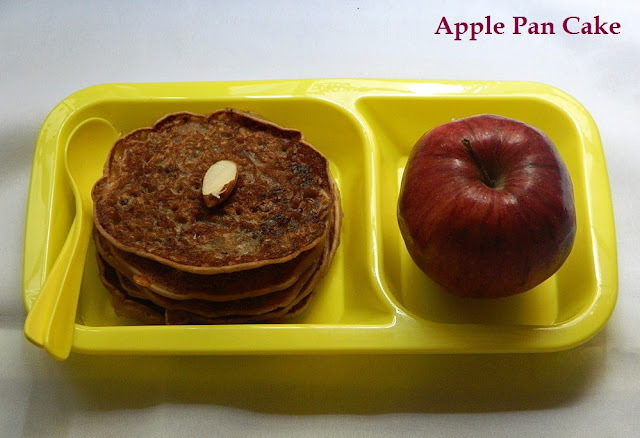 Apple Pan cake is the best option for a sweet and healthier pan cake which I am sure your kids will surely like. This is the best option for making your son to have apples and get all the benefits of it. I usually make dosas at home but the sweeter version never tried. It makes a perfect taste for the kids. But be sure to fry these pan cakes well on both the sides. I added a pinch of chocolate powder to it and hence the color got changed. You need not add it. I also added Khishmish for better taste. 1. Wash the apples and grate them along with the skin since the apple skin has most of the vitamins and rich in fiber content. 2. In a mixing bowl add wheat flour, all purpose flour, grated apple. 3. Add rest of the ingredients cardamom powder, powdered sugar, baking powder, Khishmish, salt and mix well. 4. Add milk little at a time and mix well. If required add water and make sure about the consistency of batter. It should not be too thin. 5. On a frying pan spread little ghee, when heated pour a laddle of batter on the pan in small circular shapes. Flip on the other side when done on one side. Fry them well. 6. You can serve this along with milk for your little one.